Pinchbeck United are pictured after their 4-0 win over AFC Stanground. Netherton boss Jon Harrison insists his players cannot afford to dwell on their Peterborough & District League President’s Premier Shield disappointment. 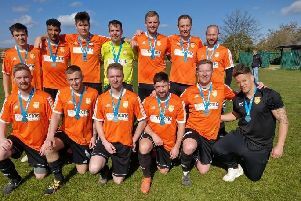 The city team suffered a semi-final exit when going down 3-0 at table-topping Moulton Harrox last Saturday, but they quickly shift their attention to another ‘massive’ game. That’s how boss Jon Harrison has billed a showdown against fellow Premier Division promotion hopefuls Whittlesey Athletic at The Grange this Saturday. And he admits victory would provide a perfect birthday present on the day he turns 35 with his team desperate not to lose any further ground on a Whittlesey side they already trail by 14 points in the standings. Harrison said: “We would have loved to have reached the Shield final again, but it was always going to be a tough task going to Moulton. “They are flying this season and they just didn’t let us play. They’re the best side we’ve faced this season – and I include those from the UCL that we have met in the county cup in that. “We’ve got to get that defeat out of our minds quickly as we have a massive game in the league against Whittlesey. “It’s a must-win if we are going to stand a chance of finishing above them in the table to win promotion. Whittlesey chief Andy Lodge was quick to emphasise the importance of the fixture in the promotion battle, but he is also eyeing the title. His second-placed side moved level with leaders Moulton last Saturday when easing to a 3-0 success against Thorney although they have played two more games than Harrox. Lodge said: “The fact we are the two teams to have applied for promotion adds extra spice to it. “We’re in the driving seat when you look at the table, but I would never be foolish enough to count Netherton out. “I’ve had some good conversations with my chairman and everything appears to be on track with the work off the field for us to be promoted. “Therefore it is likely to boil down to who finishes highest in the table out of ourselves and Netherton, and that makes Saturday a six-pointer. Ollie Maltby, Joe Townsend and Ben Allen hit the goals for Moulton Harrox in their semi-final triumph over Netherton. They will now face local rivals Pinchbeck in an all-Lincolnshire final of the President’s Premier Shield. Pinchbeck eased to a 4-0 success at AFC Stanground in the other last-four clash courtesy of goals from Ashley Murrell, Bradley Murrell, Tony Edwards and player-boss Ian Dunn. The final is at Stamford AFC’s Zeeco Stadium on May 13.